Bellthorpe Reverse 2 (State Forest) has tracks ranging from easy to advanced. Infact one of the tracks we followed ended up needing to either turn up or down a advance track. That track is hard and may need winch and/or lockers to make it up through the bull dust. 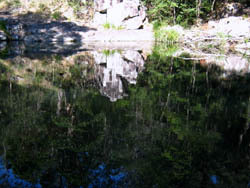 The swimming hole is just fantasic and is a must on a hot day. Normal cars can make it into the water without much issue. The tracks vary and are well posted for the 4 wheel drivers. You may need to use your GPS to get out if you get lost in there. There is no tracks on the EPA web site so it is follow your nose. The GPS tracking was attempted and lost signal in the gully.